Comedian Julie Klausner hosts this tribute to country singer Bobbie Gentry who had a smash hit in 1967 with “Ode to Billie Joe.” The evening includes the premiere of never-seen archival footage of Bobbie Gentry performing in Vegas, plus performances by Klausner, Jill Sobule, Ted Leo, Laura Cantrell, Jean Grae, Tammy Faye Starlite, Eszter Balint, Nath Ann Carrera, Josh Kantor, Phil D’Agostino and surprise guests. Throwing Muses frontwoman Kritin Hersh just released new LP Possible Dust Clouds, a rock record that hearkens back to the Muses’ ’90s era. She play a release show tonight with former TM basses Fred Abong on the bill as well. Morricone Youth will play a live score along to a screening of George Romero’s iconic zombie classic Night of the Living Dead, which sounds like a good way to spend Devil’s Night. Frontman for indie rock vets Giant Sand, Howe Gelb is delving “into the lost art of the piano standard” on his current tour. This monthly tribute party will be deep in human flies and goo goo muck as they salute the late Lux Interior and The Cramps. Guest vocalists include Eugene Hutz (Gogol Bordello) Cait O’Riordan (The Pogues), Jack Terricloth (World/Inferno Friendship Society), Jesse Malin, Daddy Long Legs, Miss Guy (Toilet Boys), and tons more, plus DJs Jonathan Toubin and Howie Pyro. Beach Fossils threw a very fun Halloween party at Brooklyn Steel last year, and this year they’re back, with Wavves in tow, for two spooky nights at Elsewhere. Kevin Krauter, formerly of Hoops, opens. 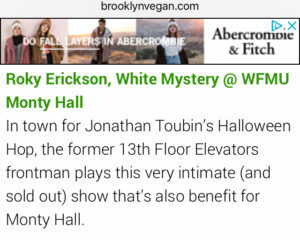 Bushwick venue Alphaville is throwing this free Halloween covers extravaganza featuring bands as Gary Numan, X, The Go-Gos, Radiohead, and Mazzy Star. You may remember that Broad City‘s Ilana Glazer hosted the four-part “Generator Series” in July where she interviewed activists and politicians “to see how they each serve us – the people.” She’s bringing the Generator Series back for four nights leading up to the midterm elections. Meanwhile, the other half of Broad City, Abbi Jacobson, releases her new book, I Might Regret This: Essays, Drawings, Vulnerabilities, and Other Stuff, tonight and will talk about it at this event tonight. TV on the Radio’s Kyp Malone lets his freak flag fly with Ice Balloons who are much more of a straight-up party than his more well-known group. Gothy artist Shana Falana and the heavy/punky Feral Scouts make for a fun triple bill. 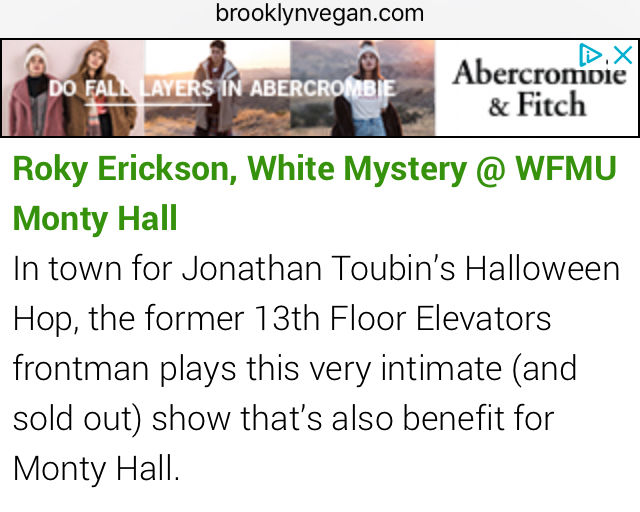 In town for Jonathan Toubin’s Halloween Hop, the former 13th Floor Elevators frontman plays this very intimate (and sold out) show that’s also benefit for Monty Hall. It’s still okay to dance like Molly Ringwald, especially when seeing Richard and Tim Butler’s veteran alt-rock/new wavers trot out on the hits. “Love My Way,” “Into You Like a Train,” and “President Gas” still sound great. Chief Keef isn’t as omnipresent as he was during the “I Don’t Like” days, but he’s stayed incredibly prolific and released at least a few other gems over the years.